This is what I had for dinner tonight (followed by a secondo of chicken breast). Spiralized Zucchini (also known as zoodles) is so well known as substitute for real pasta, that we’d almost forget that it is also really good in combination with real pasta. 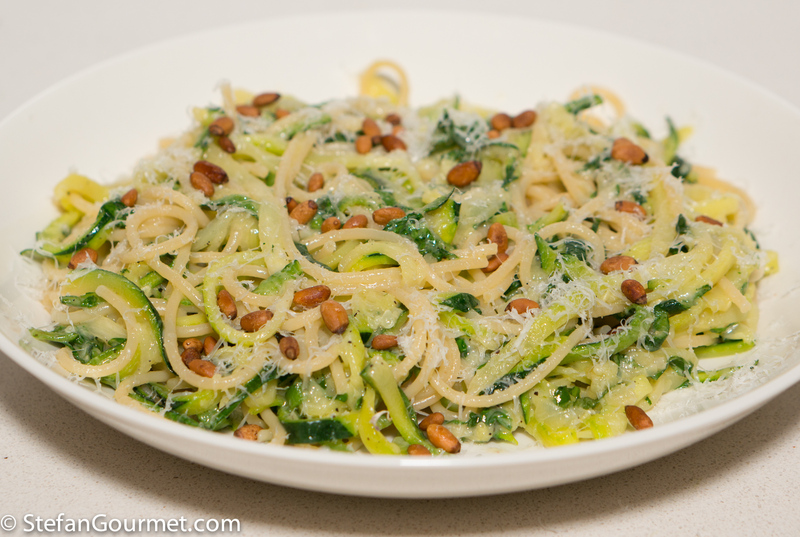 If you remember my posts about how to choose a pasta shape, you will known that spiralized zucchini will work well with long pasta like spaghetti (not the thinner spaghettini) or tagliolini (not the wider tagliatelle) rather than short pasta. 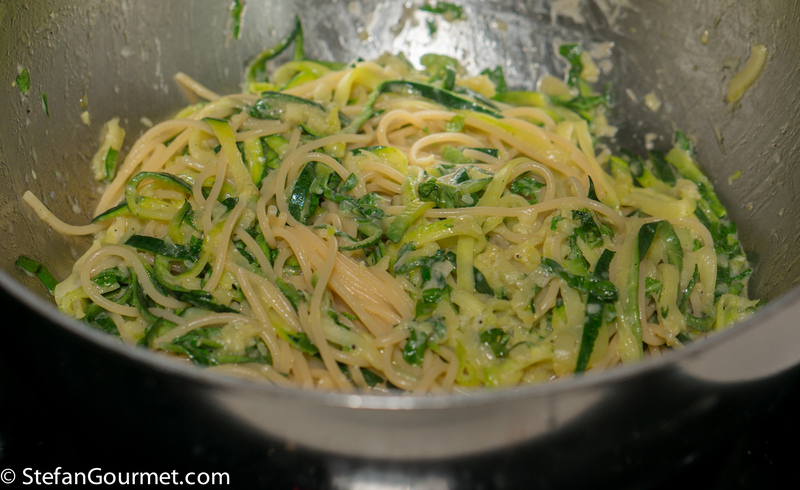 For the most interesting texture, both the zucchini and the spaghetti should be al dente. I stir fried the zoodles briefly in garlic-scented olive oil, and then tossed them with the drained spaghetti together with basil, parmigiano reggiano, toasted pine nuts, and some pasta cooking water. It only took me 16 minutes to prepare, cook, and photograph this dish, but it was delicious and very elegant. Bring a large pot of water to a boil. When the water boils, add salt and the spaghetti. 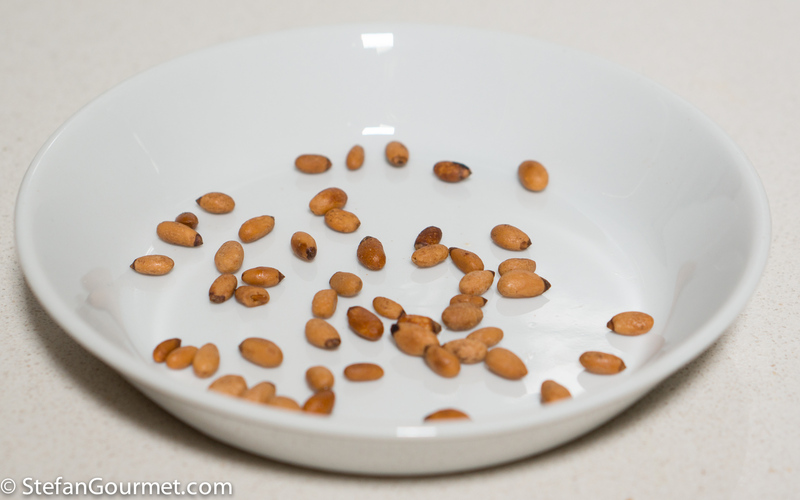 Meanwhile, toast the pine nuts (for about 7 minutes in the oven at 180C/350F, along with heating up the plate(s)). Heat 2 tablespoons of olive oil in a large pan or casserole. The large size will come in handy when stir frying the zucchini. 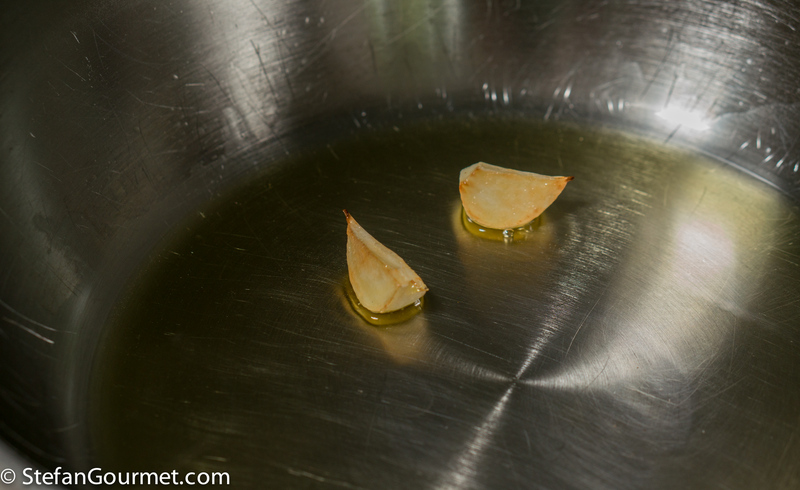 Add the garlic clove (I had cut it in two) and cook until golden on all sides, then discard. This will lightly flavor the oil. 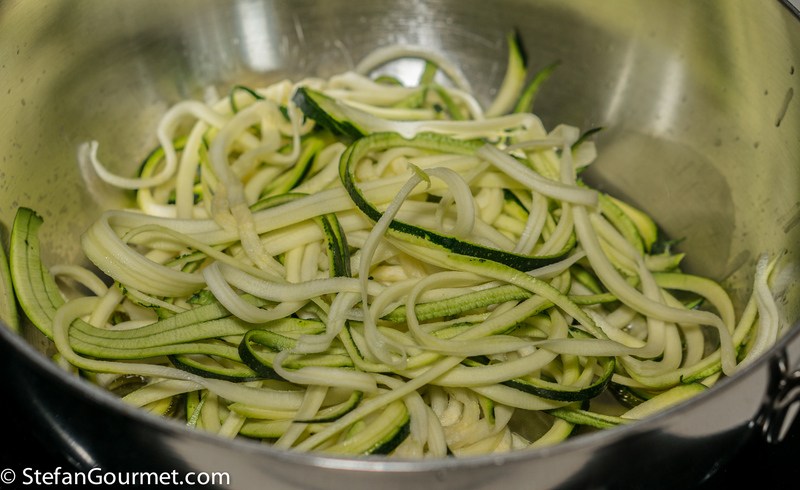 Add the spiralized zucchini and season with salt. Stir fry until the zucchini starts to become tender, then turn off the heat. Slice the basil into strips. 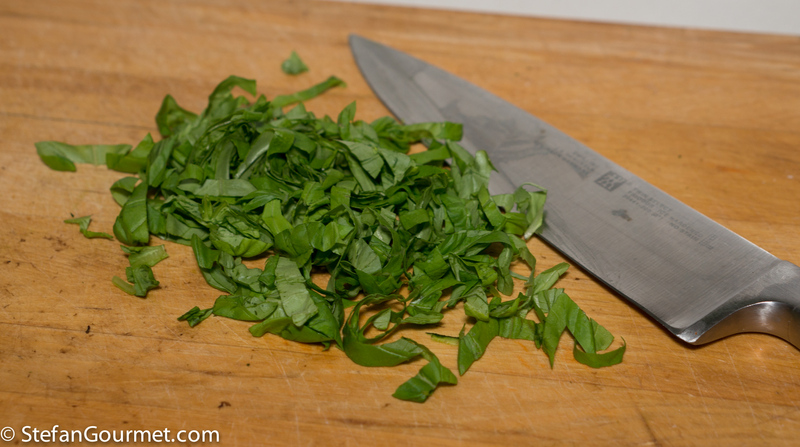 Do not chop basil as that will bruise the leaves, but if you slice with a sharp knife that is as good as tearing the leaves and a lot faster. Drain the spaghetti when it is al dente, but reserve a couple of tablespoons of the cooking water. 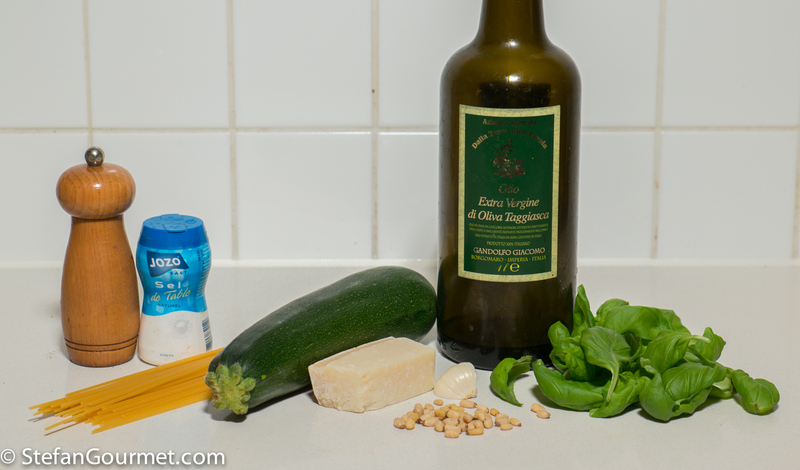 Toss the zucchini briefly over high heat, then turn off the heat, add the drained spaghetti, as well as the basil, a handful of freshly grated parmigiano reggiano, and some freshly ground black pepper. Add the reserved cooking water. 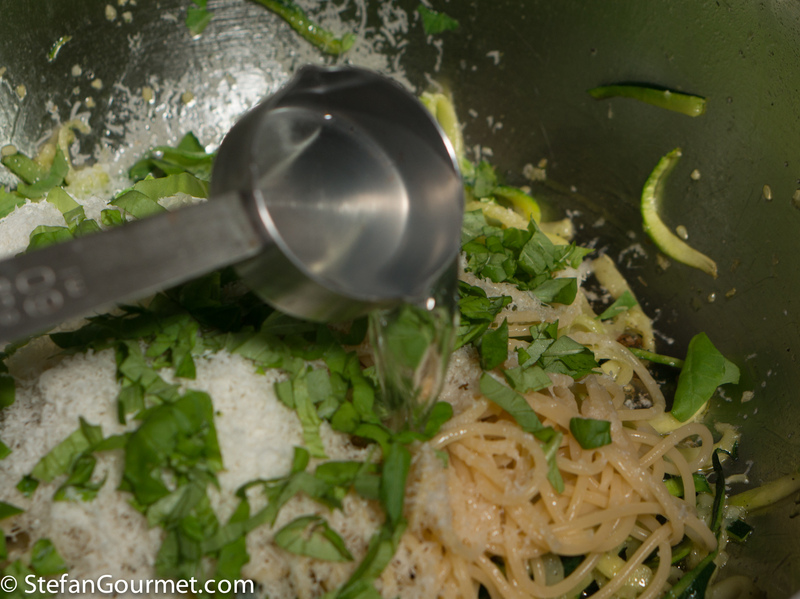 Stir and toss the spaghetti with the zucchini until it is mixed well. Taste and adjust the seasoning with salt and freshly ground black pepper. Serve on preheated plates, sprinkled with the toasted pine nuts and some additional parmigiano. 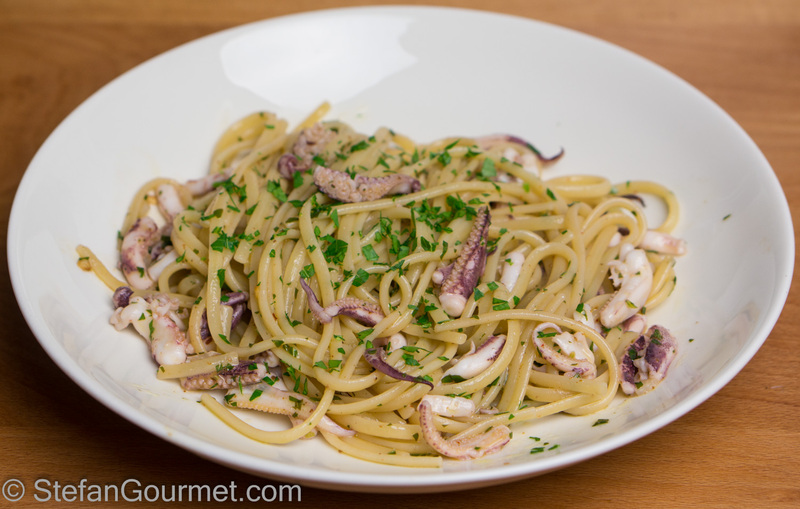 Two years ago I blogged another quick and delicious pasta dish: linguine with calamari tentacles. Ma questi aggeggi funzionano sempre solo nelle mani degli altri? Questo funziona davvero, però solo il lato spesso. Il lato sottile non funziona. Looks wonderful! I’ve never seen a spiralizer like yours! VERY appetizing 🙂 Cheers ! Literally ‘thank you’ for my lunch: on a hugely busy day was wondering what would please and just a ‘click’ fixed that 🙂 ! No secondo needed methinks for me! Main lesson learnt today: shall put my pine nuts into the oven instead of reaching for my small stovetop pan – shall get a much more even result I am certain !!! I often make something similar (sometimes minus the pasta). I love how simple this is. I plan to try it tonight.